As most of you are aware Oscar Pistorius (the Blade Runner) is on trial in South Africa for the murder of his girlfriend, Reeva Steenkamp. Michelle Burgar, a neighbor, was the only witness today. She testified to hearing gunshots and “petrifying” screams from a female. The defense attorney, Barry Roux, tried to get her to say the screams could have been Pistorius but she said she heard two distinct voices. Regarding the gunshots Roux tried to get her to say they may have been the sound of a bat breaking down the bathroom door but she insisted it was gunshots. I have attached a link to a great article outlining the entire case below. This entry was posted in Uncategorized and tagged barry roux, blade, bladerunner, defense, murder., Oscar, Pistorius, Reeva, runner., steenkamp, trial on March 4, 2014 by edimminger. The judge is a woman: Thokozile Matilda Masipa, a former crime reporter who made headlines in 1998 when she became the second black woman to be appointed to the high court. She has a history of firm judgments in crimes against women. There are no jury trials in South Africa so the judge will render the final decision. 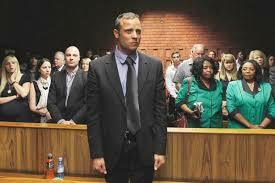 Pistorius has a strong legal team: Barry Roux is the primary lawyer with more than 30 years’ experience. He was able to destroy the police case at the bail hearing so that the man in charge of the investigation, Hilton Botha, was removed from the case. Roux charges about $6,000 a day. Kenny Oldwageis another of his lawyers. He is famous in South Africa for defending Sizwe Mankazana, a man who drove the car that killed Nelson Mandela’s 13-year-old great-granddaughter. That man was aquitted. The defense also has many expert witnesses, they even spoke to Henry Lee (according to Lee), famous for defending OJ Simpson. An expert team from the U.S. will reconstruct the crime scene. There is also a geologist on board. The lead prosecutor is Gerrie Nel, a very serious lawyer who won a corruption conviction against a South African police chief- Jackie Selebi. Selebi was also head of Interpol. The lead detective is Vinesh Moonoo, a father of two who is the top cop in South Africa. For premeditated murder the sentence is life (25 years) in South Africa. If found not guilty on this charge he could still get culpable homicide and face 15 years. This entry was posted in Uncategorized and tagged defense, legal., murder., Oscar, Pistorius, players, prosecution, Reeva, Stennkamp, trial, who, witness. on March 1, 2014 by edimminger.